The captive wild horse above is the reason that I've barely talked with you since biologist Craig Downer and I returned from BLM's Fallon corrals, Sunday, then searched out remnants of the wild herds of the Calico range on Monday. 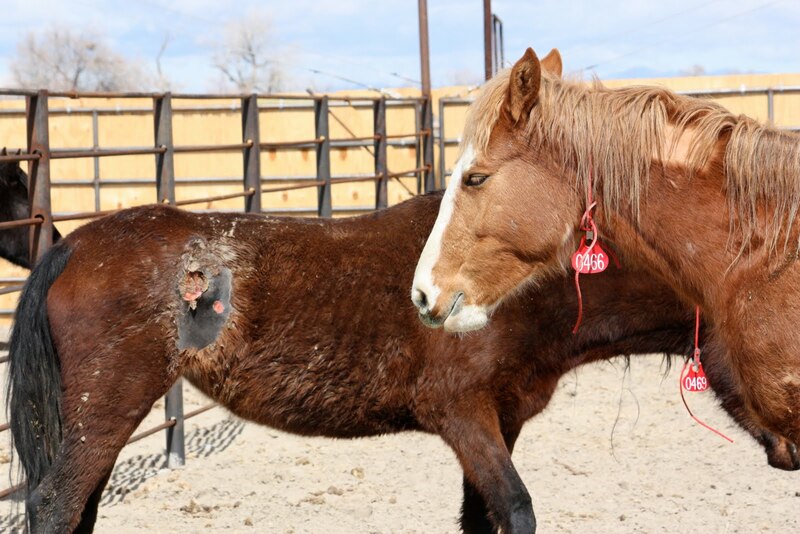 When photographer Cat Kindsfather enlarged this photo, she realized that the seepage from this mustang's awful wound had pulsed all the way down to his hoof. This callous cruelty cannot be allowed to continue. The medicine hat stallion is apparently a mare. 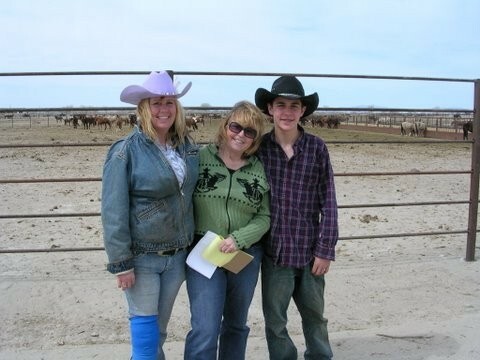 When Mark Terrell and I were out at the Fallon corrals last month, our guide pointed out stallions, mares, weanling pens, and we just accepted the designations. Today, photo in hand, I found the horse that mesmerized me. Though she appears to have lost flesh, she was in a pen with mares and new foals. That's what I'm basing my discovery on, since I didn't have a telephoto lens to check her anatomy. The tour was unsettling because of the MANY foals in with adult horses. In the wild, that would of course be the case, but only after mother and babe had a few days off alone. Our guide indicated foals being "invisible" to BLM until they are several months old is widespread among the wild horse facilities everywhere, but suggested we double-check the BLM policy manual. There's a new set of hooves in Heaven. BLM's death tally for the week doesn't show what happened. However, visitors are allowed to tour the tax payer funded Indian Lakes wild horse facility. It's land-locked inside a private ranch in Fallon, Nevada, but opened once each week by reservation only for two hours. Three observers from the CalNeva Cloud Foundation and photographer Cat, visited Sunday, March 21 and took photos, video and notes. 11:45 visitors observe buckskin mare and newborn foal in a pen with other adult horses. Foal looks like "he had melted into the contours of the ground" according to one observer and Mr. Neill said the foal was a weak newborn from the night before. 1:45 Tour ends, passing by the buckskin mare and her foal. Mr. Neill agreed with visitors that foal might be sick and indicated he would check on it. If necessary, a vet would be called. He added that volunteers from WHOA might be asked to bottle feed the foal if it couldn't rise to nurse. 2:00 as observers depart, foal is still down. Still no deaths listed for the weekend**, but one observer calls and talks to John Neill who says "the colt was euthanized." She understands Neill to say the vet had determined the colt had a broken femur and must have been kicked. The caller commented, "Oh, that's why he never got up." Neill replied, "No, he was up that morning nursing." Sometime after that, he speculated, the colt must've been kicked." Neill said the foal was destroyed via chemical injection. 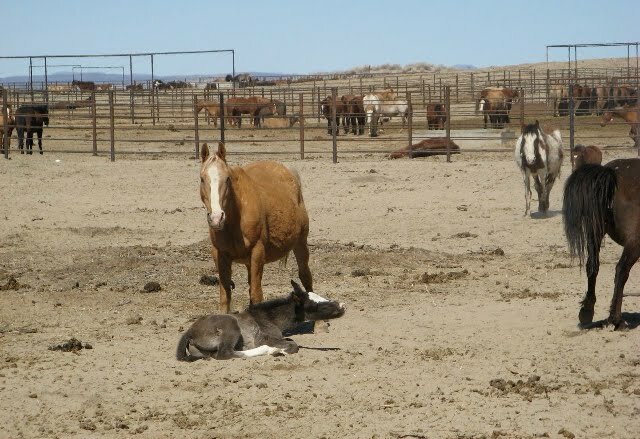 I reached John Neill at Palomino Valley wild horse corrals and he answered my questions about the Medicine Hat stallion I've told you about before and this foal. ** Live births are not entered into BLM's system until horses have been freeze-branded, which takes place after four or more months. Since foals delivered "in facility" are not listed as born, they are not listed as dead. 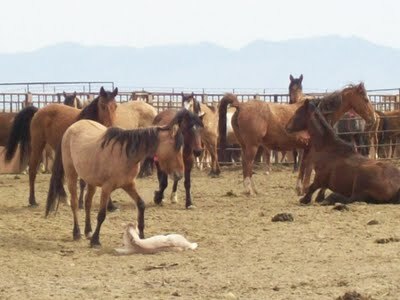 So, they are not posted on BLM's online Calico Round-up updates. John Neill described the last hour of the little dun's life. "He was down during the tour. 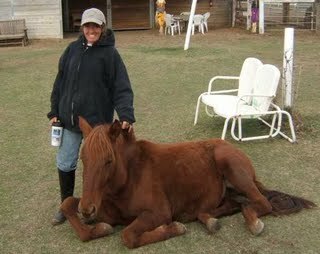 Afterward I went out to check on him and he was packing a right hind leg and he had to be put down." "When did the vet come?" I asked. "Was it a compound fracture so that you could see it was broken?" John answered, "I could just tell, so I took care of it." After our call ended, my English teacher brain flashed to "I am cruel only to be kind." Hamlet, I remembered, and knew that if I were watching over a newborn foal with a fatally fractured femur, I would not want it to suffer. But "Hamlet" ends with a stage strewn with corpses. I tried to get confirmation that such a leg injury is easily diagnosed, but the two vets I consulted disagreed on both diagnosis and prognosis. John Neill told me "We have births daily and if something happens like this or there's a bad mother, we can't track them all accurately." Is it fair to the public that our mustang foals are born and die without notice? This is not Neill's decision; it is BLM policy. As with so many other BLM policies, the numbering of lives and deaths are rough estimates. There are no disposable mustangs. Taxpayers have no disposable income, especially for a system they hate. 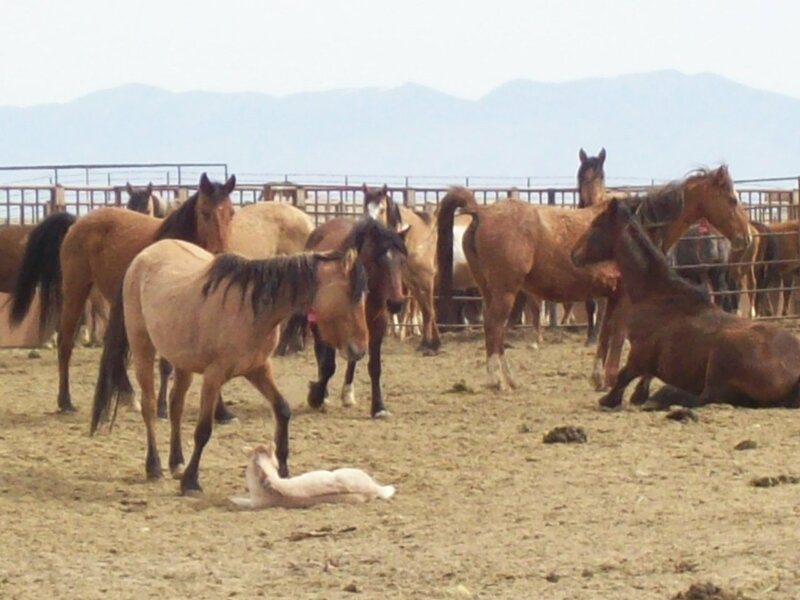 There must be a moratorium on the capture of our wild horses, before a ruined system erases an entire species. Thursday, March 25th, the March for Mustangs will take place not only by the White House in Washington DC but also on the Las Vegas Strip, by the Los Angeles Federal Building and in front of the US Embassy in London! In DC we’re honored to have award-winning actress and advocate, Wendie Malick speak to the crowd at the rally. Wendie will be joined by long time advocate and advisor on the original 1971 Wild Horse and Burro Act, Hope Ryden; author RT Fitch, Filmmaker James Kleinert and many, many more! We are especially pleased to announce that country music artist Clay Canfield will be at the rally to sing his incredible song “Wild Horses” and more before we march to the BLM office with signs and banners. Please spread the word on all the March for Mustang Rallies and support all the protests with calls to your Senators and Congress people on this important issue. Wild herds, like Cloud’s, are being managed to extinction with our taxpayer dollars by the very agency charged with their protection. Let’s make a big push for the mustangs during these rallies. On Thursday please call your on behalf of Cloud and all the wild horses! President Obama: 202-456-1111 and Congress: 202-224-3121. When you reach your Representative and Senators, please ask to speak to the aide on the wild horse and burro issue. 1) Wild horses are being mismanaged in cruel waste of taxpayer dollars that is destroying the last of our wild herds in the West. 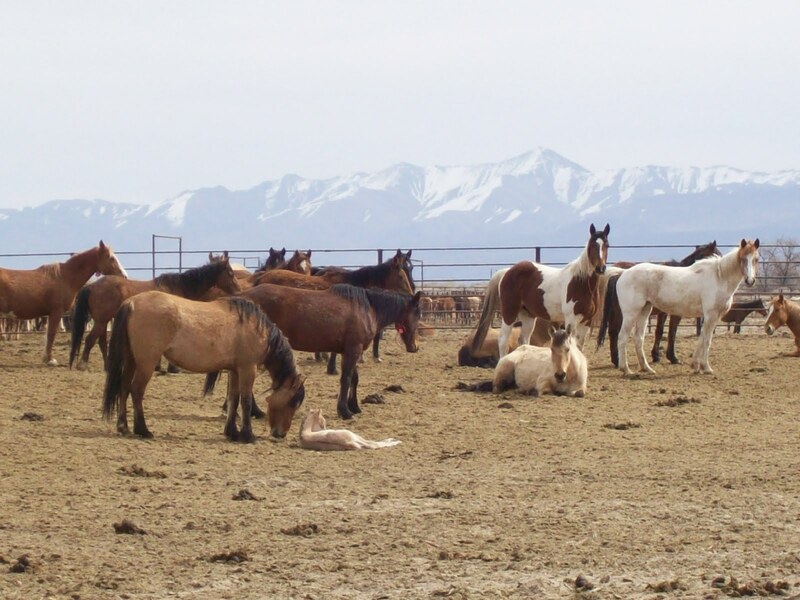 2) Vote NO on supplying funding for wild horse “preserves” in the East and Midwest– already there are now far more (36,000) wild horses in holding than in the wild where there may only be some 15,000 remaining. 3) Keep up the call for a moratorium on roundups and let everyone know that you love wild horses and burros in the wild and you vote! Or find and email your Senators and Congress person here on votesmart.org. Whoa, look! Tune into CNN's Issues with Jane Velez-Mitchell on Thursday at 7:30 EST for an in-depth discussion on our wild herds and a recap of the D.C. Rally! As usual, I've been hangin' around the Girls Horse Club barn, and the Lead Mare just posted a link to a great wild horse movie clip I think you'd appreciate. My March newsletter is finally out and I think you'll have fun reading it, too. The photos are especially good this issue and Sam's blog might just make you smile. Here's a plea for help and a FREE horse! I was asked to help find a home (quickly) for a perch x filly, turning 2 at the end of May. She was an unexpected present out of a Perch mare purchased at NH a couple of years ago- mom does carriage rides, trail rides, etc. Filly is well handled, kind of golden right now but will be grey- not yet broken, sound, no issues, will probably finish around 16h. Farm owners need to find her a home- Mr Farm Owner feels she will be OK if they take her to NH to sell, Mrs. is worried and would rather find her a home NOW. Filly located in North East MD, call or email me for contact info. I bet you'll enjoy reading this story! 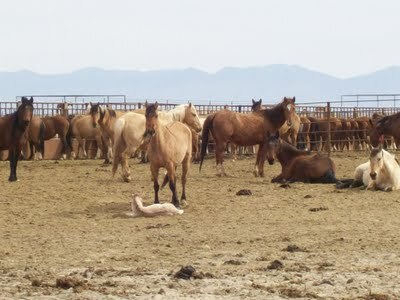 Nevada horse activist Dorothy N. took this photo at the Fallon wild horse corrals on Sunday. We think the horse in the second corral from the front -- follow a straight line back from the gray foal's muzzle, past the prone horse just past the next set of bars -- the one with his adobe and white colored head hanging low, might be the Medicine Hat stallion. Three wild horse advocates searched for this captive horse today. They couldn't find him. If BLM can't supply photo verification that he's still there, we need to know what's happened to him. Those of you who read my books know that I'm partial to sorrel horses like Hoku and sassy little bays like Ace, but this horse, because of his flashy coloring SHOULD be easy to follow through BLM processing. I will ask BLM if I can go out and search the corrals this week. Wild horses and artists: what traits do they share? Tenacity . . . adaptability . . . intelligence? If those sound like handy qualities to have in these tough economic times, you will appreciate the thinking behind Horse HeART, an upcoming equine art exhibit, art competition, and fundraiser to benefit wild horses, hosted by Art Attack Gallery in Incline Village, Nevada. Featuring art that evokes the kindred spirit of horses and artists, Horse HeART seeks to inspire viewers to negotiate the economic recession with flare. “We chose the Mustangs as our muse because they epitomize the kind of resilience that we all need,” explains Mark DeSautel, owner of Art Attack Gallery. Horse HeART will run March 12 through April 12, 2010, with a wine and chocolate reception on Saturday, March 13, from 4-8 pm. For the Horse HeART event, Art Attack Gallery is teaming up with the Let ‘Em Run Foundation, a non-profit organization co-founded by country western singer, Lacy J. Dalton, working to preserve wild horses. Proceeds from a reception-night raffle, featuring such enticing prizes as a springtime guided adventure to see wild horse herds with their new foals and art prints by participating artists, will go to the Let ‘Em Run Foundation. In addition, Art Attack Gallery will donate a portion of the proceeds from art sales to LERF. For more information about the work to preserve Wild Horses, please visit the Let ‘Em Run foundation’s website at www.letemrun.com or the Wild Horse Preservation League’s website at www.wildhorsepl.org. This newspaper article tells how one American woman collects horses from auctions, outbidding people who want them for pets or saddle horses, then sells them for meat. Her excuse? Her family's been doing it for years (which kinda undercuts her argument that it's the fault of the economy). click here to watch the sweetest YouTube video of Shetland foals at play and then sit back and smile. THIS WEEK a congressional committee will meet and discuss giving BLM yet more money to round up and corral wild horses. They're already spending millions of my tax dollars to do something most taxpayers despise. Want to send a message that this is a bad idea? This will only take you two minutes. You'd spend longer than that looking for your keys. Instead, look into your heart (and wallet) and do what's right. IMPORTANT TIP: Change the subject line and write your own first line to the letter (at least). 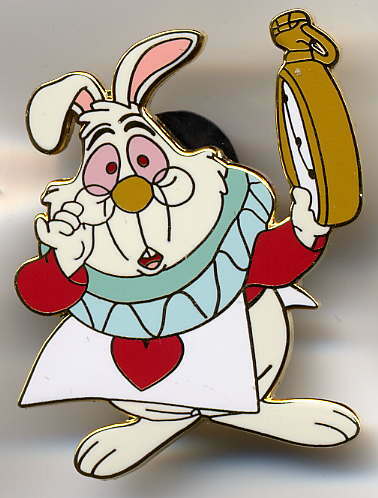 This might keep the congressional committee members from thinking "yeah, yeah, here's another one." Can't think of a new first line? You could try something like "Please freeze BLM's wild horse budget until a full investigation can take place." I'm sorry my March newsletter is so late! I was late getting it to my wonderful web designer and now she's in the hospital. Please send all you best thoughts her way and I'll stay in touch with you via the blog! I'm awaiting news from BLM in Reno, hoping to know why no updates on activities, injuries and deaths at the Fallon facility haven't been posted since last week. I know lots of PHANTOM STALLION readers are fans of Jake, whose family heritage is Shoshone, so I had to show you Sequoia. If you want a gentled and trained companion with wild blood, whose mother roamed Shoshone tribal lands, please read on and feel free to share this with other dressage and mustang fans. DRESSAGE MUSTANG LOOKING FOR A NEW HOME. Here's a great chance to take over the adoption of a professionally trained Shoshone Indian (Dann Sisters) mustang. Sequoia is a 15-2 (and still growing) four year old mare out of a Dann Sisters mare. She was originally a W.I.N. horse placed by LRTC. She has been professionally ridden three times a week for close to two years and is in training as a dressage prospect. According to trainer Holly Love, Sequoia is a "big mover" with potential. Holly says that she hasn't pushed Sequoia really hard into collection, etc., because she's still growing, but she feels that the mare is coming along well. The mare has also been ridden outdoors and given this past California winter, "She's gotten used to being ridden in mud." Sequoia needs a new home since due to economic conditions her adopter can no longer keep her. Sequoia is presently located in Knightsen, CA (near Stockton, CA) For information about her training history please write dressage trainer Holly Love windream@dishmail.net. Sequoia has documented origins and Shoshone horses qualify to show at the Western States Wild Horse and Burro Expo. Given her size and training, Sequoia could make a great show prospect!